Today is both Easter and April Fool's Day, making it an absolutely atrocious day for announcing new products. After all, on Easter, many people are busy with their families -- it will be very easy for technology news to get overlooked. Not to mention, companies often announce fake products on April Fool's -- anything announced will be questioned as being either real or not. That isn't stopping Cloudflare from announcing an ambitious (and real) new project, however. Today, the company announces a new consumer DNS service with a focus on privacy. Called "1.1.1.1" it quite literally uses that easy-to-remember IP address as the primary DNS server. Why announce on April Fool's Day? Because the IP is four ones and today's date is 4/1 -- clever. The secondary server is 1.0.0.1 -- also easy to remember. The big question is why? With solid offerings from Google and Comodo, for instance, does the world need another DNS service? The answer is yes, because Cloudflare intends to focus on both speed, and more importantly, privacy. "What many Internet users don't realize is that even if you're visiting a website that is encrypted -- has the little green lock in your browser -- that doesn't keep your DNS resolver from knowing the identity of all the sites you visit. That means, by default, your ISP, every wifi network you've connected to, and your mobile network provider have a list of every site you've visited while using them," says Cloudflare. The company further says, "Network operators have been licking their chops for some time over the idea of taking their users' browsing data and finding a way to monetize it. In the United States, that got easier a year ago when the Senate voted to eliminate rules that restricted ISPs from selling their users' browsing data. With all the concern over the data that companies like Facebook and Google are collecting on you, it worries us to now add ISPs like Comcast, Time Warner, and AT&T to the list. And, make no mistake, this isn't a US-only problem -- ISPs around the world see the same privacy-invading opportunity." Sadly, DNS servers can be a weak link when attempting to surf the web securely. Cloudflare is aiming to not only create a more secure experience, but a faster one too. 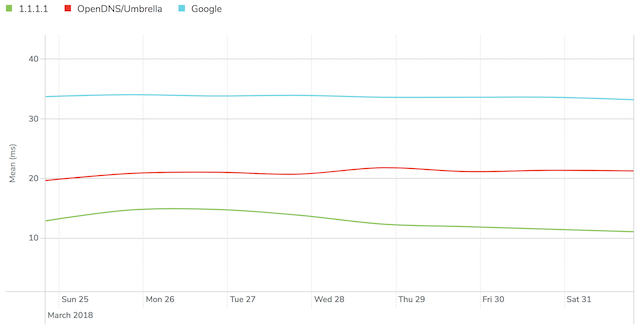 As you can see above, its new 1.1.1.1 service is quicker than both Google, OpenDNS, and the rest. Quite frankly, there is no reason not to give this new DNS service a try. Privacy? Speed? Sounds good to me. If you do decide to give it a go, there are a couple of ways to do it. You should, of course, configure the DNS servers on each of your devices if possible, but you should also do so on your router. 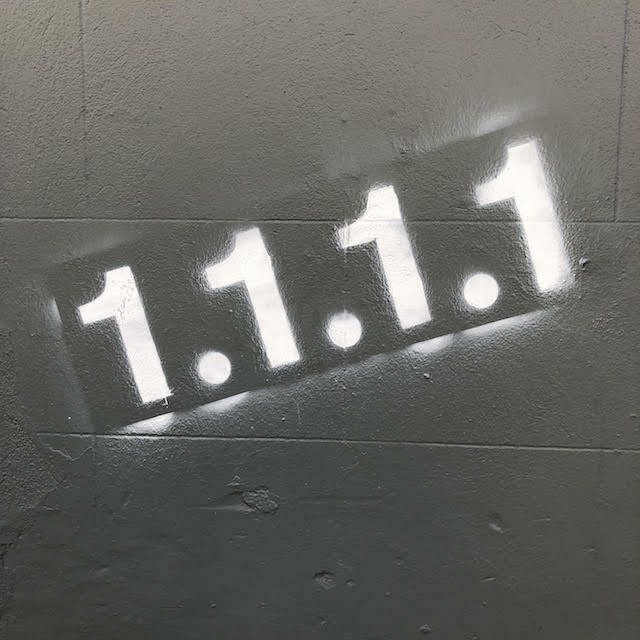 This way, anything that connects to your home network will utilize 1.1.1.1 when resolving DNS, including devices that don't provide access to DNS settings -- such as some IoT devices. Thankfully, Cloudflare makes switching very easy for novices. Never changed your DNS servers before? Still using your ISP's offering? No worries. Simply visit https://1.1.1.1 and click on "Install." The website will detect the operating system you are using, and you will be presented with instructions for that particular OS. To configure your router, just click on the link that says "Router". To make sure this wasn't an April Fool's joke, I tested it myself by configuring my home router to point to 1.1.1.1 and 1.0.0.1. Sure enough, it works flawlessly. Did I notice any speed difference compared to my previous choice of Google? No. To be honest, any speed boost that Cloudflare offers will be minimal in real life experience. The privacy angle is definitely the more important aspect. Will you be switching to Cloudflare's DNS service? Please tell me in the comments below.